Today finishing this review of Akopov’s piece from last Thursday. Akopov has quoted several section of Putin’s speech, including the Russian President’s criticisms of the Globalization process. Unhampered Globalization, in Putin’s view, destroys cultures and nations which took centuries to build. It turns these cultures and nations into “faceless protectorates” and just mushes all the people together. All the easier to be governed and controlled by their Globalist Overlords. Who sit in palaces far away, and across the ocean. Where we left off yesterday Putin had laid out a couple of multiple-choice quiz questions for his listeners. For example: What kind of world is emerging now, and what kind of world should emerge? (A) Monopolar, this is a world with only one center of power, namely, the United States of America. If all the world is a stage, then this play has only one actor, and all the text is a just an extended Monologue. Putin calls this scenario The Law of the Fist. (B) Multipolar, this is a world with several centers of regional power. Monologue is replaced by Dialogue, and nations collaborate on positive issues such as trade and economic development. Fistal Law is replaced by International Law. Relationships among nations are governed by protocols of mutual respect, along with observance of basic moral and ethnical norms. There is one thing I am sure of: The voice of Russia will ring out with dignity and confidence, in this world of the future. This is pre-determined both by our traditions, and by our internal spiritual culture, our consciousness, and, finally, by the very history of our country as a bona fide civilization. A civilization that is unique, but does not pretend, assertively and arrogantly, to be exceptional. Because (we know that) it is not possible to even imagine the history of mankind without such unrepeatable civilizations, as India, China, Western Europe, America, and many others. This is most certainly a many-faceted complexity, every facet of which supplements and enriches each other. 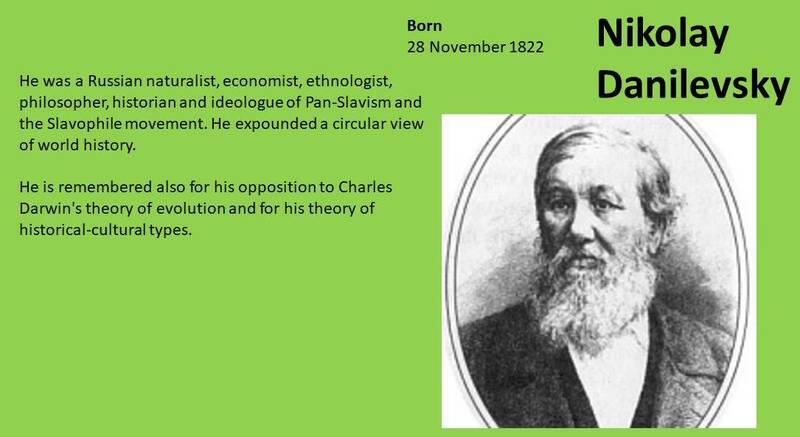 Sidebar on Danilevsky: This noted Russian scientist and philosopher was an opponent of Darwin’s Theory of Evolution. He was in the process of developing his own “teleological” theory of evolution, in which the world was put together by a Creator and led on through a series of steps, to achieve some kind of end. Putin may have been referring to the popular notion of Darwinism when he spoke out against the “Law of the Fist“. In opposing Fistal Law while also rejecting Marxism (along with its platform of Economic Equality as the basis of Social Justice), Putin is evidently trying to have his cake and eat it too. He wants to keep capitalism running, but soften its amoral features. To do this, he has to draw on non-socialistic philosophical inspirations from the past, pan-Slavs and their ilk. Who ended up, usually, finding Orthodox God and joining the Church. Like Dostoevsky, for example, who started off as a Social Justice Warrior, and then ended up as a Doxie. And before I shut up, I just have to say one more thing, namely, I can easily defeat a pan-Slav in any political debate by uttering a single word: “Poland“! This always sends them running for cover, whilst screaming ineffectually. Okay, now I shut up and continue translating Putin’s speech: Today, the understanding of this type of complexity in the development of civilizations, serves as a fundamental basis for a multi-polar world, for defending the principles of international law. And the influential weight of the poles of future development, of course, must be defined by their economic, scientific, cultural, spiritual, and humanistic foundation, by their (human) potential. Putin visionarily sees a world in which there is no such concept as “higher’, “lower”, “advanced”, “backward”, “developed”, “under-developed”, etc. nations. It should not be a world of lecturers, and those who are lectured to. 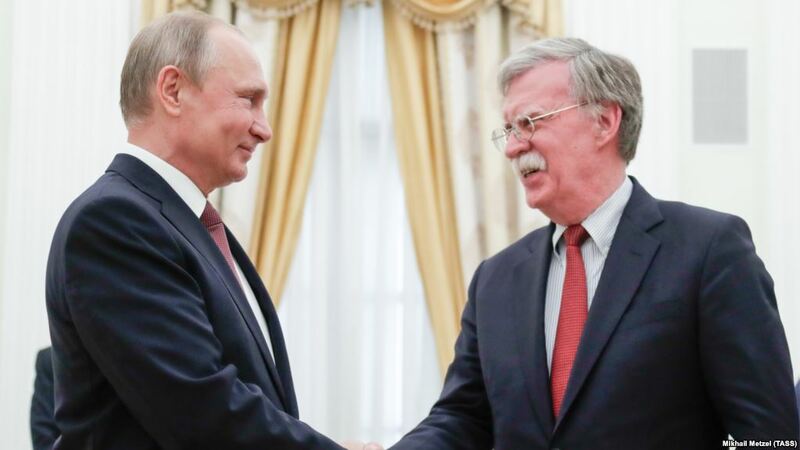 [TRANSLATION: Putin has gotten sick and tired of dealing with odious and self-righteous creeps such as Heather Nauert and John Bolton!] Here is our proposal, he says: We won’t impose our values on you, and you don’t do that to us, neither. And then Putin does something beneath himself: He takes a cheap shot at Communism: Saying it envisioned an era in which all national borders dissolve, and all nations and civilizations merge into a single human entity. The Liberal Anglo-Saxon Globalists are exactly the same, he says, and no wonder, since they grew from the same ((((root)))) as the Marxists, with their theory of a unified human market. One could mention, of course, that Putin is not in a strong position when he discourses on national boundaries. Given that Stalin’s USSR was something like twice the size of the modern Russian Federation before Putin’s mentor, Boris Yeltsin, got his hands on it! And also that Putin and his cohorts lost the Ukraine. But that’s another polemic, for another time. Russians will never give in. Russians are suggesting that all civilizations stand up for their uniqueness; and, on this basis, build a new world order. Each nation for itself; and all standing together against those who are convinced of their right to herd and lecture other people. Everybody to break out in a rousing and uncynical chorus of Freude, schöner Götterfunken! This entry was posted in Russian History, The Great Game and tagged All-Russian Peoples Gathering, Nikolay Danilevsky, Putin. Bookmark the permalink. They’re Sarmatians – just ask them them! And my screaming is never ineffectual. *Neither are Bulgarians, except on the rare occasions they’re behaving themselves. Nor Croats. What are you trying to say, Pavlo? That you are not a Pole, because your screaming is always effectual? Okay, it’s a logical inference, I’ll accept that. Aristotle would agree, as well. Good to see you referencing such a well-known Ukrainian speaker. Bravo! Bravo! Still trying to come down after the rousing chorus of Freude, schöner Götterfunken! However, I have to leap out in defense of this particular Putin’s speech, the cheap shot “he” took and the undeserved catty retort he earned from you in return. The quote was indeed beneath him, so I checked the transcript of the speech and he never said that. That paragraph (and also the one about lecturing and advanced/backwards nations) are Akopov’s words, not Putin’s. What Putin said was: “The weight, the influence of the poles of future development, of course, will primarily be determined by their economic, scientific, cultural, spiritual and human basis, potential. That is why our and your efforts are so important to unite and consolidate the work of civil society and the state. What our ancestors called conciliar intelligence, conciliar experience.I want to thank you for the very important mission for our society and state that you have been performing for 25 years. I wish you success! Thank you for attention.” AND HE ENDS HIS SPEECH THERE, then Akopov’s follows up with the words about Communism: “The many-sided complexity of world civilizations should become the basis of a new world order – in which there will be no higher and lower ones, “advanced”, “developed” and “backward” and “underdeveloped” teachers and students. This is what our program is: no one imposes his values ​​on others, all are valuable and interesting as unique civilizations. 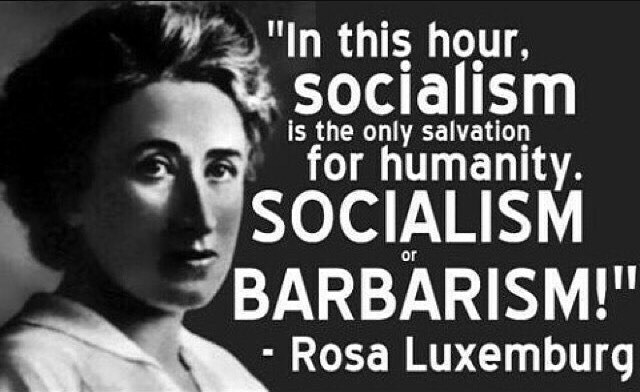 There is no mixing and dissolving all in one – neither as under communism with its extinction of borders, nations and civilizations, nor as with liberal Anglo-Saxon globalization (which actually grew out of the same root as communist ideology) with its single humanity-market.”. This is so non-existent in what Putin said that it seems more like Akopov’s personal opinion rather than his interpretation of Putin’s speech. Bravo, Nat! Thank you for your invaluable fact-checking and data-diving, as always! I apologize to all and sundry if my cattiness was misdirected, and if I mistook (as I apparently did) Akopov’s editorial remarks for part of Putin’s speech. I should have known better, especially given the fact that Akopov has already established himself as a sort of ALT-Rightie Cuck in the Russophile blogosphere. Since I am typically cynical, I suppose I should join you in laughing at Putin’s naive proposal for a multipolar world in which nations respect one another and the law is a body agreed upon, devised by, maintained and enacted by common consent – international law, and managed free trade. But it seems to me such a world once existed. Perhaps it is I who am naive, but that’s the world I remember before Bill Clinton and his embarkation upon the enlargement of NATO. I know that’s hard to imagine, because there can’t be too many more anti-Soviet than Ronald Reagan. And even after Clinton’s NATO enlargement, just before the USA and UK teamed up to simultaneously seize Ukraine and demonize Russia non-stop, we seemed to be making progress toward some kind of global equilibrium where Russia was concerned, and the criticism seemed more catty than a ramping-up to a global war. Anyway, nearly everyone who is not a committed drone of one side or the other seems to agree that things have gone way past the point of no return, and that we are either headed for another global war, or a lengthy period of social breakdown in which international institutions have crumbled and nations pursue their own interests nakedly, egged on by their friends and toadies. And that sort of situation could flare into war at any time. The best real chance of avoiding war seems to be stalling it until it would be unsustainable for the United States, either through simple economics because it can’t afford its gargantuan ‘defense’ budget, or because it has pissed off its allies to the extent they will not follow it into battle. Thanks for your hard work in translating this, it was very interesting for me. Thanks, Mark. I regret that I lost my temper and attributed to Putin stuff that was actually inserted by Akopov (as Nat pointed out). In retrospect, Nat probably should have translated Putin’s remarks, instead of myself. I will try to do a better job next time. The Kremlin website has an english version where the translated speeches are published. This particular one is here: http://en.kremlin.ru/events/president/news/59013. And I agree with Mark, you did really a valuable work in reading and translating Akopov’s analysis as well. It’s more interesting as it gives an idea about what the press/political analysts/society thinks of the topic. Thanks, Nat! I bookmarked that Kremlin speech site, so I can use it in the future. Yeah, when I first started this blog, I thought I would just be doing straight translations from the Russian press. But then as my blog concept evolved, I started doing more “analysis and review” than straight translation. Well, frankly I write on whatever interests me, but hoping that my work feels a certain need to understand the various shades of Russian political opinion. Which is why I end up reviewing a lot of op-eds and historical analyses. Obviously, I could do a better job in not mixing up different utterances of difference people; not to mention facts with opinions! Yalensis, a propos of nothing (well, it came to me from a comment I read on Mark’s blog), I remember the excellent detailed post you wrote following the KirovLes affair, presenting the different testimonies, proofs, etc. It really clarified many points and I still have it saved from Mark’s old blog. I was wondering if you did something similar on Serdyukov and Vasilyeva and if you would still have it. If I remember correctly she was charged with bribery but he never was (he was charged with negligence), and many were mystified that he didn’t go to jail. The view I kept from that time is that he was an incompetent idiot but not a corrupt official (i.e: he naively let himself be used by his mistress without actually knowing what she was doing) and that the whole story was in fact a revenge thing because he was cheating on Zubkov’s daughter, the Prime Minister then Deputy Prime Minister he was serving (just shows how bright he is, cheating on his boss’ daughter). Was there more to it? Were there proofs/testimonies he participated in the corruption along with Vasilyeva that were just conveniently discarded allowing him to not go to jail? In short, in your opinion and recollection of the case, was he guilty or not guilty? P.S on the block of text I just wrote: The comment actually was Mark’s: “Mmmm, yes, Serdyukov, who was never punished in any way for his naked and obvious thievery, other than losing his job. A fact I still cannot credit. ” So I guess my question is: Thief or not thief? Nat, these are excellent questions; but, no, I never did write anything on the Serdyukov affair. The only thing I know about it is some comments on Mark’s blog. Sounds like an interesting story, though. If you want to write something yourself, you always have a venue on my blog; or I bet Mark would also chafe at the bit to have you write something! Strictly speaking, the phenomenon to which the civilizational, multipolar, polycultural discourse objects is not globalization but globalism – i.e the specific type of globalization associated with the universalist pretensions of Western liberalism. It’s a subtle distinction, but an important one nonetheless. Globalization is a process; globalism an ideology. At least, as far as I understand it.